Loud snoring while sleeping can lead to fragmented and un-refreshing sleep which may result in impaired daytime performance due to tiredness. Loud snoring may affect the sleep quality of your bed partner and possibly the rest of the family. Loud, frequent snoring may be a sign of sleep apnea. People with untreated sleep apnea commonly report that they feel just as tired upon waking as they did when they went to bed! This can set up a cycle of exhaustion often accompanied with a sense of frustration at not having the energy to carry out tasks to the best of one’s ability. Many people with untreated sleep apnea comment that they wish they had the energy to be able to exercise more. People with sleep apnea often report they experience a headache or a “groggy” or “hung-over” feeling upon waking. Many state that they wake with a dry mouth and/or sore throat and many wake during the night to drink water because their airways are so dry. 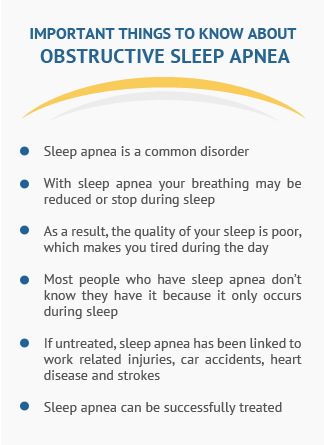 Fortunately many of these symptoms reverse once treatment for sleep apnea is commenced. People with untreated sleep apnea often experience considerable lethargy and fatigue. Some report nodding off at work, feeling irritable due to exhaustion, have a decreased ability to concentrate with reduced memory recall and some even experience micro-sleeps while driving a vehicle. Treatment for sleep apnea often resolves this overwhelming sense of fatigue. Do you have any of the symptoms described ? “It’s changed my life really. 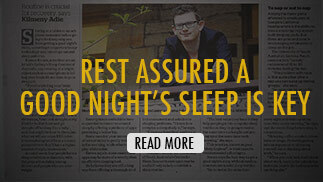 Sydney Sleep Centre is a convenient one-stop-centre for all sleep & breathing related issues. Our Sleep Clinic offers Sleep Specialist Consultations, diagnostic tests and a range of treatments for Sleep Disorders, all available at the one site. Be sure to check out our Sleep Store to see our extensive range of sleep clinic products. "A Centre Dedicated To Diagnosis, Investigation and Treatment Of All Sleep Disorders."